Imagine, you are ready to attend the important meeting in your office. You need to rush to office. You just get into your vehicle. Now, you put car key in the ignition, you are trying and trying but are simply unable to turn the car key. What to do? There is nothing in your hand except worry, frustration and car key which is not turning. It may happen to every vehicle owner. Wait.. Simply wait before you frustrate, burst out of your nice attire and hit the head off the key attempting to force it. You can try more soft and effective approach to tackle the problematic situation. Your vehicle has a steering lock. When the car key is taken out of the ignition, this lock clicks into position. This protects your vehicle from probable theft of being able to steer your vehicle by hotwiring it. Many times, the wheel turns to just the appropriate position to keep your car key from being unable to engage the steering wheel lock. 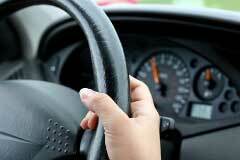 What you need to do is to turn the wheel slightly in either direction while turning the car key. Possibly, this may work out making everything moving once again. Now you are ready to get back to your work! Majority of the vehicles make use of key to power and initiate the engine. If you are stranded somewhere or need to reach somewhere, then a key which don't turn in the key cylinder is real cause of frustration. In order to turn a key, the vehicle must be in the park position. Locked steering wheel can also result into key that won't turn. 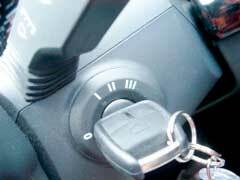 Remember worn car keys do not have capability to turn the ignition cylinder. It is advised to replace such keys to avoid frustrations. To deal with the situation, first of all, put the shift lever totally in park. Remember, if the car is in between the gears, your car key will not turn. Try to turn the steering wheel from left to right. Occasionally, a steering wheel can stuck and lock up. This may the key cylinder to lock. Consequently, you are not able to turn the key. Rotate the key c in anti- clockwise direction to the "Off" position. Now, rotate it in clockwise direction to the necessary position. If anything do not work, then it can be beneficial to consult a car dealer for a new car key. A worn lock might just require some lubrication to turn correctly. In such case make use of professional lubricant. You can buy W-D 40 from local auto dealer shop. This will help facilitate the smooth sliding of gears. Now, try to turn the key again. If the rust or debris is the problem, then lubricant will solve the problem. In some latest automobile models, the ignition key will not turn if the brake lights are failed. This safety feature has been developed for protecting the people. If your car is facing the problems due to this useful feature, then you need to pull up the emergency brake. Now, try once again to turn the ignition key. If your vehicle starts, drive it right away to a repair shop to fix the brake lights. Like the brake lights, some latest cars do not start without the driver wearing the seat belt. If you own such a car, then wear the seat belt and try to turn the car key. If all of the above options do not work, then it is essential to change the complete ignition assembly altogether. This can surely hit hard on your pocket, but this is the thing which can't be avoided. So, next time, if your car key won't turn, stay calm and focused and try to look for the best possible solution.